The wacky spirit of the lamp. He spent centuries cooped up in the lamp till Aladdin found him. He must grant three wishes to whoever controls the lamp, even if they are evil. Genie spent ten thousand years stuck inside the magic lamp until Aladdin found him. After Genie helped Aladdin defeat Jafar, Aladdin used his third and final wish to set Genie free. For Genie, it's a dream come true. Instead of being at every master's beck and call, he's enjoying a carefree life. A bubbly, blue, boisterous character who lives inside the magic lamp. He has great power and will grant just three wishes to each of his masters. But not all masters have good intentions, and as for Genie's own wish — well, those he cannot make come true. In the datascape, Genie met Aladdin after the boy was banished to the desert by Jafar, and they became fast friends. A bubbly, boisterous character who lives inside a magic lamp. A young man from Agrabah, and a bubbly, boisterous character who lives inside a magic lamp. "Sora! Donald! Goofy! You guys are too much! If you're ever in the mood for some more cosmic razzle dazzle, gimme a shout, okay?" Genie is the spirit of the magic lamp and is a recurring character and Summon in Kingdom Hearts, Kingdom Hearts Chain of Memories, and Kingdom Hearts II. He is originally from the Disney movie Aladdin. As a genie, he holds the cosmic power of granting three wishes to the one who holds his lamp. Genie explains the rules of the lamp. Genie's lamp was first discovered by Aladdin in the Cave of Wonders. He planned to use his three wishes to help Jasmine and then win her heart, but all of Aladdin's wishes ended up being wasted on getting him and his friends out of trouble. The first wish was spent on getting rid of a Heartless attack and the second one to rescue Jasmine from Jafar. Eventually, Iago steals Genie's lamp and gives it to Jafar, who forces Genie to show Jafar the Keyhole of Agrabah, as well as assist him in fighting Sora, Donald, Goofy, and Aladdin. Lustful for even greater power, Jafar demands Genie turn him into an all-powerful genie. After Jafar is defeated, Jasmine is kidnapped and taken to another world. Genie offers to return Jasmine to Aladdin, but Aladdin wishes Genie free from his lamp prison as he'd promised earlier. He then allows Sora to Summon him to aid in further adventures. Genie serves as a fragment of Sora's memory in the Agrabah floor. After Sora defeats Jafar, who is also a fragment of his memory, Genie gives Sora a card that allows Sora to summon him. Genie reappears in Agrabah, where he talks to Roxas and Xion. By this time, Genie and Carpet are on their way to travel the world. Once Genie hears that Agrabah is in trouble he decides not to go on his tour, but his decision is swayed by Roxas after he tells him that Aladdin wants to fix the town himself. After Roxas inadvertently helps Aladdin and Jasmine, Genie is thankful for Roxas' aid and departs once again. In the Kingdom Hearts 358/2 Days manga, Genie helps Roxas and Xion defeat the Antlion by holding it still to stop its rotation. Genie eagerly offers his assistance. When Sora, Donald, and Goofy reach Agrabah, they learn that Genie has gone off to see the world along with Carpet. However, he reappears near the end of Sora's first visit and annoys Pete, who tries to free Jafar from his lamp. Later, Genie clears out a sandstorm for Sora when they try to go the ruins outside of Agrabah to find Jafar, and later repairs the damage Jafar caused to Agrabah as a genie. Data-Sora visits Data Agrabah and is seen talking with Data Genie. Genie helps Sora throughout his journey to debug Agrabah after Sora recovers his lamp from Iago. This time, however, Genie fights alongside Sora instead of Aladdin. Genie is a fun-loving and wacky character. Never frowning, never still, he is always ready to brighten up someone's day. He is an eternal optimist, not caring that he has been stuck in a lamp for 10,000 years. He is incredibly loyal to his master, but equally loyal to his friends. The Genie is a large, sky blue being with black hair tied into a topknot (secured by a small gold ring). He has a small, pointed nose and curved, pointed ears. He wears a single gold earring on his right earlobe and has a black beard that ends in a curl. Like other Disney characters, Genie only has four fingers on each hand. He wears a gold bracelet on each wrist, later revealed to the "shackles" that symbolize his enslavement as a genie. 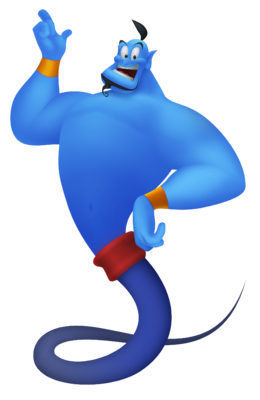 Normally, Genie's legs are usually nonexistent, replaced by a ghostly tail that is a slightly darker shade of blue than the rest of his body. A red sash divides the upper and lower halves of his body. Due to his virtually unlimited magical power, Genie can morph his size and appearance in any way he chooses, allowing him to alter his appearance into anything he desires. In Kingdom Hearts, he is able to perform multiple magic tricks to attack Heartless, such as shooting magic beams and performing magic spells by activating the command on the lower section of the menu, Showtime. His attacks can only become available if the player locks onto a target. Genie appears as a summon card after clearing Agrabah's Room of Truth. When his card is used, Genie appears and casts either Thundara, Gravira, or Stopra. Stocking multiple Genie cards create the Showtime Lv2 and Showtime Lv3 sleights, which increases the number of times Genie casts a spell. The Genie card is essential in forming the Confuse sleight. Also, Genie can be used to form sleights that require any summon card, including Tornado, Terror and Gifted Miracle. In Kingdom Hearts II, Genie returns as a summon partner for Sora, after obtaining the Lamp Charm. In battle, Genie wields his own copy of the Keyblade and mimics the Drive Forms that Sora has obtained, excluding Limit Form and Anti Form. Genie's form can be changed using the Drive? command that replaces the "Party" slot in the Command Menu. Genie has a different limit for each form; "Valor" Genie has Sonic Rave, "Wisdom" Genie uses Strike Judgement, "Master" Genie utilises Final Arcana, and "Final" Genie boasts Infinity. Aside from his forms, Genie can also restore Sora's HP when it is low. Genie in his Valor Form. Genie in his Wisdom Form. Genie in his Master Form. Genie in his Final Form. Genie's Keyblade has a dark red handle surrounded by a guard with two, light-blue teardrop-shaped cloud wisps pointed upward ending in a light purple gradient and connects to two circular gold cloud wisps. At the bottom base of the handle, there is another cloud wisp that seems to flow when the Keyblade moves. The shaft of the Keyblade begins white at the base and ends in a flat gold cylinder at the top. A replica of Genie's lamp sits atop the shaft and the spout of the lamp serves as the “teeth” of the Keyblade. There is no Keychain for Genie's Keyblade, as the flowing cloud wisp at the bottom connects to Genie's smoky tail. Genie originates from the 1992 Disney film Aladdin. In the film, Genie appears to Aladdin, Abu, and his long-time friend Carpet after being trapped in the Cave of Wonders. Once greetings were exchanged, Genie explains to Aladdin, his current master, that he has the power to grant him three wishes. After Aladdin and Abu trick Genie to use his magic to escape the cave, Genie brings them to an oasis, where he reveals to Aladdin his desire for freedom from the magic lamp. A compassionate Aladdin promises Genie to use his third wish to set Genie free, elating him at the prospect. Granting Aladdin's first wish to become a prince in order to win Princess Jasmine's heart, Genie and the others travel to Agrabah. There, Genie continues to assist Aladdin's courtship with Jasmine and provides with advice. When Aladdin is shackled, gagged, and thrown off a cliff by Jafar's guards, Genie grants Aladdin his second wish after liberally interpreting Aladdin's nodding head for confirmation. Not long afterwards, Aladdin becomes hesitant on using his third wish due to the pressure of being crowned sultan, which hurts Genie and strains his relationship with Aladdin. Iago later steals Genie's lamp and delivers it to Jafar, forcing Genie to become his slave. Unable to defy his new master, Genie grants Jafar's first and second wish to become the sultan of Agrabah and the world's most powerful sorcerer. Aladdin goes to the palace where Jafar was to retrieve Genie's lamp and during the final battle with Jafar, Genie was forced to grant Jafar's third wish to become a genie. However, the fulfillment of this wish causes Jafar to be imprisoned in a lamp of his own, which the Genie enthusiastically hurls into the desert. While initially more than willing to sacrifice his freedom in order to allow Aladdin to be with Jasmine, Aladdin decides to live up to his original promise and uses his final wish to free Genie from his lamp's power. Now free from the lamp, Genie bids farewell to Aladdin and his friends, and sets off to explore the world. He also appeared in the direct-to-video sequel, The Return of Jafar, where he comes back to Agrabah, but is outclassed and captured by a freed Jafar. He is freed by Aladdin and helps to stop Jafar. He continues to make appearances in Aladdin: The Animated Series and Aladdin and the King of Thieves as a central character. He was originally voiced by the late Robin Williams, but after some disagreements with Disney, Williams was replaced by Dan Castellaneta until the third film. Genie was based off a similar entity from the original tale of Aladdin in The Book of One Thousand and One Nights. This genie is more serious, and he can grant unlimited wishes. There was also a second, less powerful genie, in a magic ring which Aladdin used to recover the more powerful genie, with both of them being found in the Cave of Wonders.